Diamonds are the most precious objects most people ever see. A stone you can cradle in your palm can be worth more than the biggest house in many a good-sized town. Diamonds have a unique relationship with humans as items of personal adornment because they possess beauty, rarity, and durability. Their high degree of transparency, refractivity and dispersion give rise to a level of brilliance and display of prismatic colors that is unequaled in other gem materials. Since our business inception, we as diamond professionals have developed and adopted the best international standards for sorting and grading the characteristics of individual diamonds and setting their values. As we are fully aware that even slight differences in characteristics can make big differences in the value of diamonds, we take this value added service initiative to create customer awareness on this product. We have carefully designed this Diamonds Buyer’s Guide with a commitment to offer our clients the basic essentials of product knowledge. The key to the diamond value is expressed by the 4Cs – Cut, Color, Clarity and Carat Weight. Ironically one would assume that all diamonds are similarly cut to achieve this totally reflective capacity. This however is not the case due to one small detail – money! Because diamonds are sold on the basis of weight it is the cutters best interest to retain as much of the original crystal as possible. Cutters utilize weight retention techniques that sacrifice beauty in order to preserve profit. Most of these techniques are subtle while others are obvious, and over the years the consuming public, due largely to lack of information, have not demanded such strict cutting parameters. Today much has changed, as consumers demand to know more about each item considered for purchase. Brilliant Cutting – this refers to facet patterns that radiate from the center of the stone outward, and utilize triangular and kite shaped facets i.e. round, marquise, and oval. These cuts are specifically referred to as round brilliant cut, oval brilliant cut, etc. Step Cutting – this refers to parallel rows of trapezoidal facets, i.e. Emerald step cut. Mixed Cutting – this refers to a combination of brilliant and step cut faceting. This type of cutting will have one style on the crown and one style pavilion i.e., Princess cut and Radiant cut. It was the invention of the diamond saw in the late 19th century that provided the essential ingredient to diamond cutting. This advance, coupled with the vision of then diamond professionals created what is known as the “Ideal” cut, today. Money’, the motivating factor in a cutter’s work, depends on how much weight could be retained from the original diamond crystal. The “Ideal” cut is a double-edged sword if you are a diamond cutter – more weight is lost by cutting to these parameters in order to capture the ultimate beauty of the diamond. The final effect is that, a customer pays more for this type of cutting style. An elaboration on the “Ideal” cut diamond, known as the “super-ideal” cut, was born out of the need to provide exclusivity and brand name to the diamond Industry. This cutting style exhibits an optical effect known as “Hearts and Arrows”. According to classic Roman mythology, Cupid’s arrows hit the hearts of lovers. Shapes other than rounds are referred to as fancy shapes or fancy cuts. 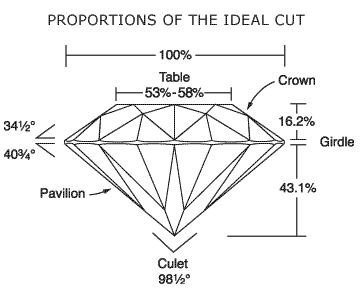 The uncut diamond crystal strongly influences a cutter’s decision on which shape outline to produce. The most popular fancy shapes are the marquise, pear, oval, heart and emerald cut. 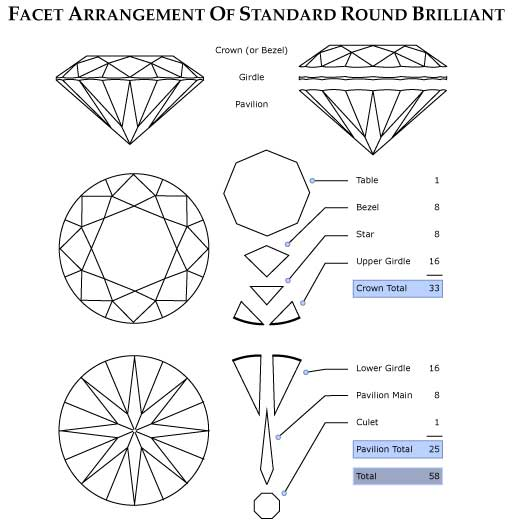 Cut and proportion evaluation for fancy shape diamonds is complicated. 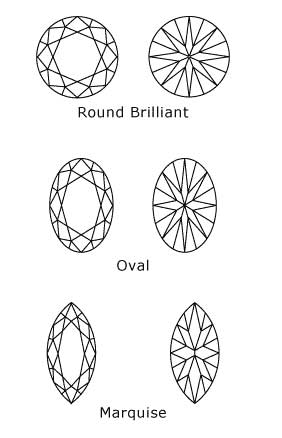 The desired appearance for fancy shape diamonds is subjective and a matter of opinion. One problematic issue that fancies incur is a cutting effect known as a “bowtie.” The “bowtie” is observed as a darkened area radiating from the center and diverging outward toward the sides of the diamond. Although hard to find, a stone without a bowtie is desired. Bowtie is a result of variations in the pavilion angles and can be overcome or completely eliminated by altering the number or arrangement of the pavilion facets. Why this corrective measure is not customarily done by the cutter has more to do with loss of weight and the corresponding monetary loss, rather than visual appeal. Another critical element in our discussion of fancy cut proportion grading is the length to width ratio. This is determined by dividing the length by the width. Length and width ratios vary from one shape to another, giving each stone its own visually appealing form. These ratios are the product of years of market assessment and sales figures that clearly demonstrate consumer preferences. Stones with ratios higher or lower than these are common but may appear too narrow or wide. Emerald cuts have step facet arrangement i.e. rectangular and trapezoidal facets arranged in parallel rows around the stone. Emerald cuts, by virtue of large mirror-like facets have a tendency to more easily show internal imperfections that might not be so easily seen in brilliant cut diamonds of a similar size. Emerald cuts usually have beveled corners, not only to add a finished look to the stone, but more importantly, to provide protection to vulnerable corners and to provide a sound setting surface. 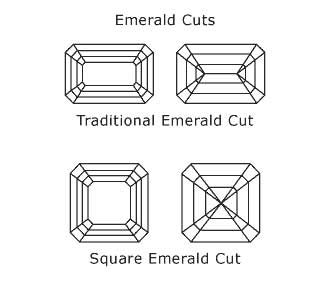 Like other fancy cutting styles, emerald cuts also have a preferred length to width ratio of 1.50 – 1.75:1. Radiant and Princess cuts are variations of the emerald cut. These variations use a combination of brilliant and step faceting, also known as mixed cutting to enhance visual appeal. 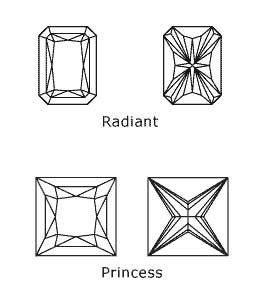 Whereas radiant cuts retain the beveled corners of the original emerald cut, princess cuts do not and therefore lend themselves to damage at the corners. Interesting enough it is the absence of color that is most desired in a diamond. Many consumers think all diamonds are colorless, as the majority of diamonds sold in the jewelry industry range from colorless to near colorless, faint yellow to light yellow, gray or brown. But diamonds occur in every color of the rainbow (few are really colorless). Diamond color grading is most accurately done when the diamond is loose. Grading diamonds in jewelry can be problematic, as the metal content of the mounting can influence the perception of the diamond color. The grading standards for assigning diamond color are expressed on a numerical or alphabetical scale. The two grading systems most commonly used are the alphabetical standard of the GIA (Gemological Institute of America), and the numerical scale of the AGS (American Gem Society). The essence of each, from its starting point, is the gradual addition of yellow tint, eventually leading to a noticeably yellow body color in the stone. For instance, the GIA color standards start with the letter D, defined as colorless, and proceeds down the alphabet to Z, defined as light yellow. All characteristics being equal, the more colorless a diamond is, the greater the price per carat. Corresponding increases in color translate to lower prices. Diamonds come in a variety of colors with varying intensity and are described as “Fancy” color diamonds. In each case it is the intensity, purity, and rarity of color that determines price. Examples of fancy diamond colors are pink, blue, green, red, yellow and orange. Inclusions are internal characteristics – other mineral crystals, bearding, bruising, cavity’s, chips, clouds, feathers, grain centers, indented naturals, internal graining, knots, laser drill holes, needles, pinpoints and twinning wisps. Blemishes are external characteristics – abrasions, extra facets, naturals, nicks, pits, polish lines, polish marks, rough girdle, scratches, and surface graining. The two Clarity grading systems most commonly used are the alphabetical standard of the GIA (Gemological Institute of America), and the numerical scale of the AGS (American Gem Society). However GIA is the most widely used and accepted in the industry. VVS diamonds contain minute inclusions that are difficult for even a skilled grader to locate under 10X. In VVS1 they are extremely difficult to see, visible only from the pavilion, or small and shallow enough to be removed by minor re-polishing. In VVS2, they are very difficult to see. SI stones contain noticeable inclusions, which are easy (SI1) or very easy (SI2) to see under 10X. In some SI’s, inclusions can be seen with unaided eye. I-grade diamonds contain inclusions which are obvious to a trained grader under 10X magnification. These inclusions can often be easily seen face-up with unaided eye and they seriously affect the stone’s potential durability, or are so numerous they affect transparency and brilliance. All characteristics being equal, the higher the clarity of a diamond, the higher is the price per carat. Corresponding decrease in clarity translate to lower prices. The metric carat, equivalent to 1/5th of one gram or 0.200 grams, is internationally accepted as the standard weight for gemstones. Diamond weights are also expressed as points, where 100 points equals 1.00 carat. The chart below estimates diamond weight and diameter expressed in millimeters based on a depth percentage of 60%. 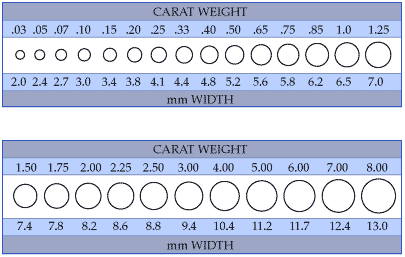 Carat weight can also reveal much about a diamonds overall cutting quality. Diamonds that are cut to proper proportions will generally have a specific dimension that correlates to their carat weight, (i.e. a properly cut 1.00 ct. diamond will measure 6.4 – 6.5 mm in diameter). There are many instances of diamonds that weigh 1.00 carat, but measure 5.9mm in diameter, creating a dimensional “look” of a three quarter carat diamond. All characteristics being equal, the higher the carat weight of a diamond, the higher is the price. As rough crystals to yield a single diamond of larger carat weight is extremely rare, the prices of single diamonds with more carat weight are very expensive. For instance, the total price for four one-carat diamonds will be considerably less than the price of a single four-carat diamond of comparable quality.